In the early 80’s my parents bought my brother and I our first home computer, an Apple II+. They had fortunately seen the writing on the wall as they knew computers were destined to be a part of our lives. That computer set the family back over $2,000, not a small sum for the time and certainly a hefty chunk of change for two mid-level government employees. Fortunately for them it did not collect dust. My brother and I could not get enough of the computer and its TWO floppy drives. We both taught ourselves BASIC programming while enjoying a number of rudimentary games available at the local computer store. One of the very first games we played was The Oregon Trail. Not only did we have it at home, our middle school had a copy they installed on their early Tandy TRS-80. By today’s standards Oregon Trail was something that could be cranked out by a child. But back then this was state of the art. It was one of the first open-ended adventure games that included some type of graphics (no disrespect to you Zork fans, but pictures win out over text any day). Your adventure was totally random, and was meant to simulate the treacherous journey west to Oregon in the mid 1800’s. You might recall from your history books that this was no vacation. Everything out there was trying to kill you, and usually did. Having any family members make the trek successfully was quite an accomplishment and The Oregon Trail game tried to simulate this. 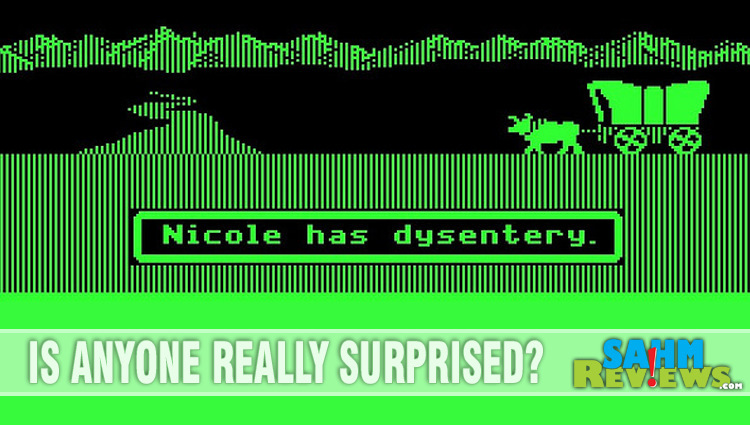 It became a running joke that it seemed everyone eventually died of dysentery. Today’s video games are way too advanced for something like The Oregon Trail. That is unless a publisher can create a version that has you battling the environment in 3D with real-time enemies and accurate physics. I’m sure the story of The Oregon Trail would be lost on today’s youth when they can just as easily pick up an in-game sword and take on a three-headed dragon. 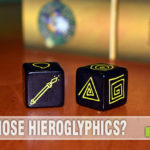 We’ve mentioned before about the resurgence in interest of board games, and it is only appropriate that there be titles that cater to themes from an earlier era also. 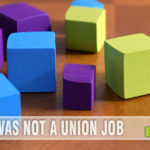 That’s when Pressmen Toy decided to publish a brand new cooperative game based upon this beloved franchise – The Oregon Trail Card Game. 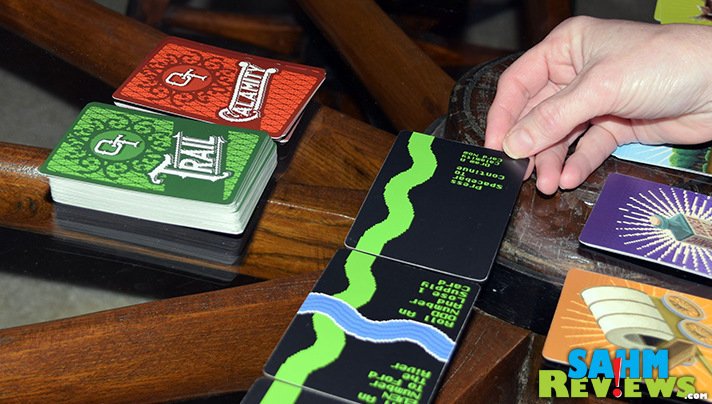 Oregon Trail is a multi-player card game (up to six players) working together to try to get at least one person to Willamette Valley, Oregon. To say the trip will be rough is an understatement. Included in the box you will find three decks of custom cards; Trail Cards, Calamity Cards and Supply Cards, along with a party roster, erasable marker and one die. 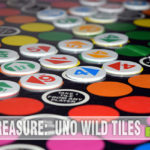 Each player begins the game with five Trail Cards and a number of Supply Cards determined by the overall number of players. The rest of the cards are placed in the center of the table to form draw decks and the supply shop. Then on their turn a player will play either a Trail Card to the table or one of their Supply Cards as needed. 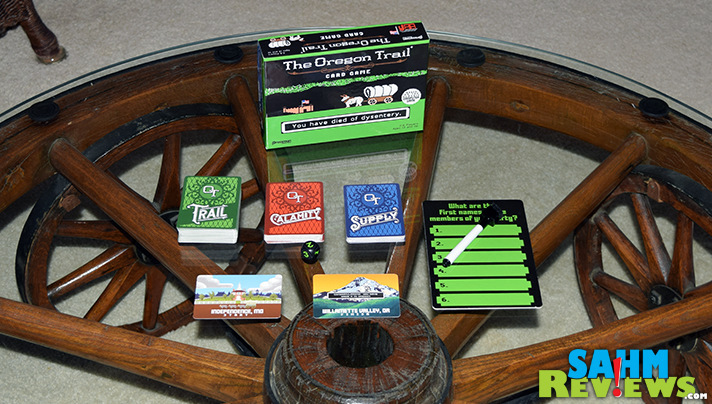 Trail cards on the table form the Oregon Trail path and are laid end-to-end. 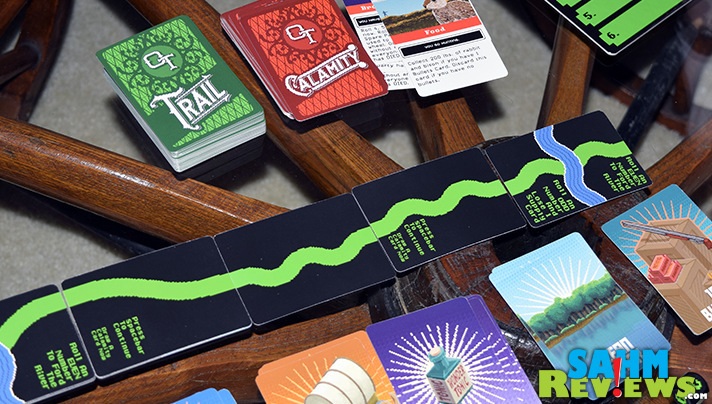 Every time five trail cards are connected, they are stacked in a pile of five and the path continues from there (this is mostly to conserve space). If you have a valid Trail or Supply Card you must play it. If you do not have a card to play, simply draw a new one from the Trail Card deck and end your turn. Certain Trail Cards will have the words “Press Spacebar to Continue” which when played forces the active player to draw a Calamity Card. As you might have picked up from the title, these cards bring disaster to your party and can affect just one player or the entire group. They disrupt the game and remain in effect until remedied by the appropriate Supply Cards. When players die on the trail (and they will! ), they are sadly out of the game. 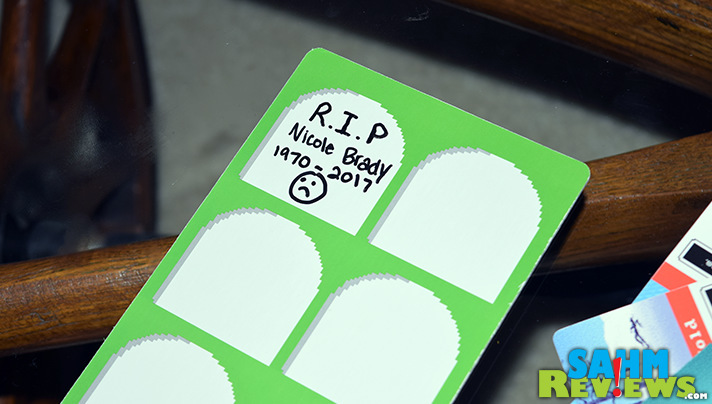 Now you get to create an epitaph for their tombstone on the roster board – a good time to poke fun at the one who died quickly! 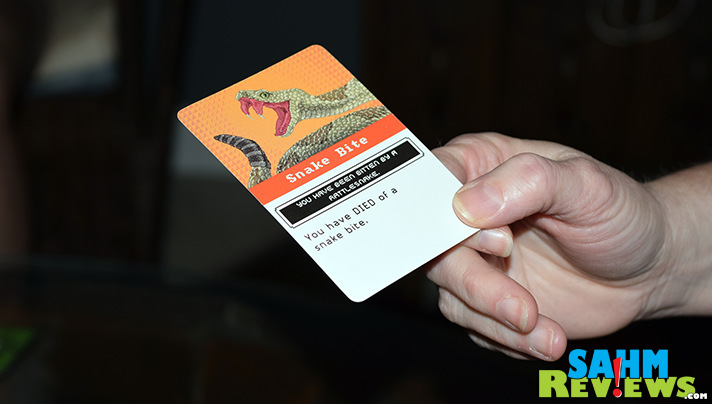 The game ends when either everyone dies (most common) or at least one person reaches the Willamette Valley by completing ten sets of five cards. If even one person makes it to the end alive, everyone wins. 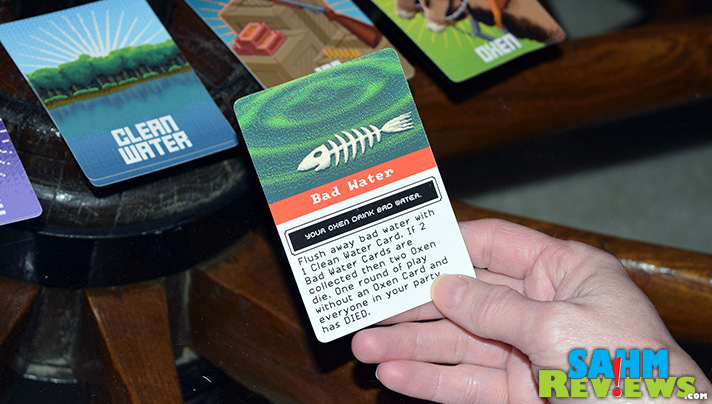 Ever since the discovery of this Target-exclusive card game, the hobby game world has been mixed in its reviews. And I’ve read a number of them since its introduction last Fall. I’m here to say I think they’re all missing the point – and here’s why. Yes, by today’s game standards The Oregon Trail doesn’t bring anything new to the table. It’s a quick and light cooperative game that is reasonably difficult to win. So if you’re looking for the next greatest/best/etc. card game, this is not it. 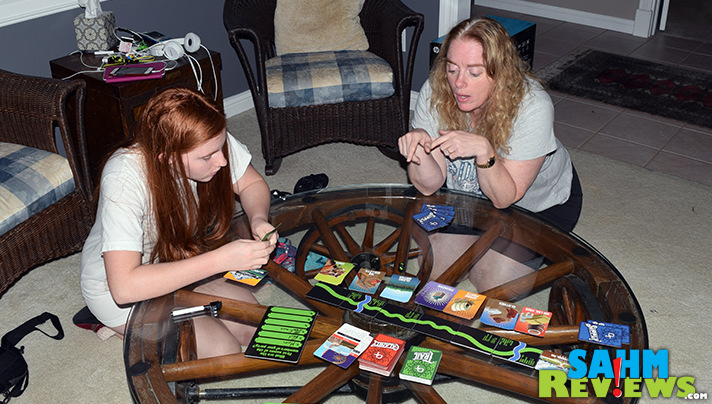 But what The Oregon Trail Card Game does is faithfully and accurately recreate the excitement of playing that DOS-based video game from nearly 40 years ago. At the most inopportune times you will die. And die hilariously. For no reason. Just like in the video game. And that’s why for just over $10 you can relive that experience. What is the price of nostalgia? In this case, less than dinner out. From looking at Pressman Toy’s website, they have a number of reissued classics that I used to play every day. I hope they decide to continue with these lines and work on converting other vintage games (Zork, Wizardry, etc.) to a board game format. I’ll be first in line! Follow them on Facebook and Twitter to find out if and when they decide to move forward! When did you first play the original Oregon Trail? There is an Orgeon Trail card game? Excuse me while I geek out and scream a little bit! This is the perfect game for my family to get away from technology for a little bit. You find the best games, Scott! This brings back memories. I am with Krysten. LOL I have fond memories of playing Oregon Trail on the old Apple computers. Ah, those green block graphics were spectacular.I love how the cards you show have the same things on them I remember from the game. I was a fan of Crossfire but I never did learn how to play these card games. I can’t understand how to play them at all. Its a great game players work together to move along the trail, fording rivers and playing cards to overcome calamities. That is quite interesting and I can see people really enjoying this game, especially the kids. It’s definitely one of the best games you can have for game night with the family. This is really awesome. It’s something that my twins would enjoy playing! I’d love for them to see this, they might be interested.